The ITIL Change Management process has two authorities; the Change Manager and the Change Advisory Board (CAB), as defined in Chapter 1. The Change Manager is responsible for obtaining authorizations for the requested changes and planning and coordinating the implementation of the approved changes. The CAB is a group that regularly meets to review significant change requests and progress, prioritize changes, and help plan the changes. The CAB should include representatives from each IT area. The scope of the Change Management process is coordinated with the scope of Configuration Management and Release Management processes. Configuration Management processes determine the impact of changes and updates the change management database (CMDB). Change Management does not include activities considered Standard Changes, such as creating and deleting user IDs. Activities considered Standard Changes are not done under the Change Management process but are classified as Service Requests and performed as part of the Incident Management process. Because there are typically so many Service Requests, this delineation helps to keep the Change Management process manageable, keeping the CMDB from being overloaded and the performance of the activities from being overly bureaucratic. How will you know if you are realizing these benefits? By maintaining Change Management metrics, which I discuss later in this chapter. However, first it is important to understand what is involved with the Change Management process to help you understand and appreciate the benefits measurements. At the core of Change Management are the inputs and outputs for the process and the many important connections Change Management has with the other ITIL processes. Historically, ad hoc change management resulted in wasted time and resources by performing unnecessary changes. These types of changes also typically created problems and resulted in costly incidents. Change Management creates a repeatable, efficient way to implement changes throughout the enterprise. One of the goals of Change Management is to be able to determine with a high level of certainty whether the change being considered is appropriate. This is accomplished using a request for change (RFC), as defined within Chapter 1. The CMDB data is critical for performing the change impact analysis. The FSC, sometimes called a Change Schedule, lists all approved changes and their planned implementation dates. Figure 2.1 illustrates the inputs and outputs for the Change Management process. Figure 2.1: Change Management inputs and outputs. Change Management has relationships with all the other ITIL processes. It is important for the success of not only Change Management but for all enterprise-wide ITIL processes that these relationships are appropriately managed. Figure 2.2 illustrates these relationships at a high level. Figure 2.2: Change Management relationships with other ITIL processes. As this figure shows, Change Management activities impact all other ITIL processes in one way or another. It is important for effective communications channels to exist to communicate key activities. Let's step through an example to see how all these processes are related. ACME Super Duper Supplies is going to implement a new ecommerce Web site that will allow for online merchandise ordering and payments for their new product, Magic Mover. This is a significant change in their IT infrastructure in addition to having a major impact on their business. The change must be implemented in a coordinated way to ensure all impacted areas are aware of the change, and that any potential negative impacts are minimized as much as possible. By following ACME's Change Management process, Ms. Flint, the manager of the Magic Mover business unit, will help ensure the change is implemented as successfully as possible. Ms. Flint submits an RFC for the change to the Change Management team. The ACME Change Manager gives the RFC to the CAB, which approves the change. 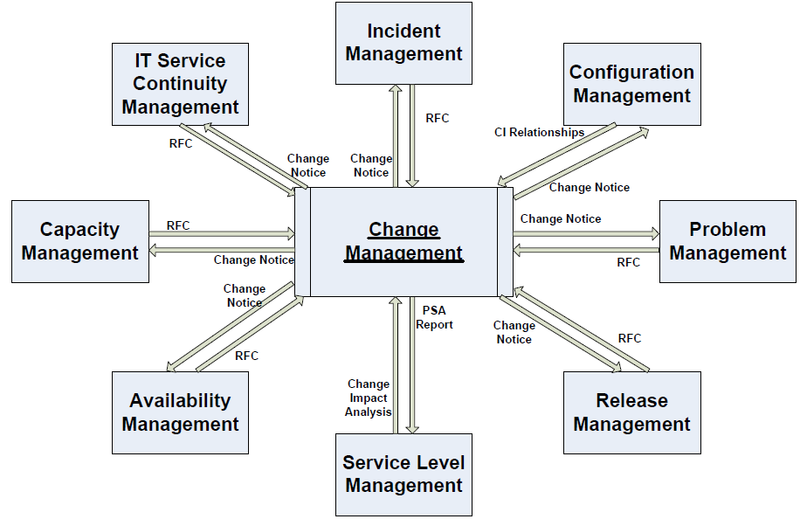 The Change Manager works closely with the Configuration Management area to provide the data from the associated CMDB to identify the relationships between the configuration item (CI) associated with adding Magic Mover to the site and determines what is affected by the change. The CAB works with the Availability Management team to estimate the potential impact of making the changes to add the Magic Mover to the e-commerce Website. Availability Management will in turn make the changes necessary to help improve service availability as it may be affected as a result of the changes. The Change Manager notifies the Incident Management, Problem Management, and the Release Management teams of the planned change so that they can determine how this change will affect them. The Change Manager sends a report to the Service Level Management team that lists the changes that will need to be made to the SLAs along with the impact of the FSC on the service availability. The Change Manager will communicate the change details to the Capacity Management team so that they can determine what the cumulative effects will be of adding the Magic Mover item to the e-commerce Web site, and they will determine what the cumulative impact of that change will be over an extended time. They may find that response time will be impacted and that more processing power is necessary. The Change Management and the CAB will work closely with the IT Service Continuity Management team to ensure it is aware of all the changes that will be made as a result of adding the Magic Move to the Web site and determine how this will impact the existing recovery plans. They can then ensure that the appropriate steps are taken to update the plans so that recovery can be completed successfully. Figure 2.3 shows now the Change Management process would flow to make the Magic Mover Web site implementation. 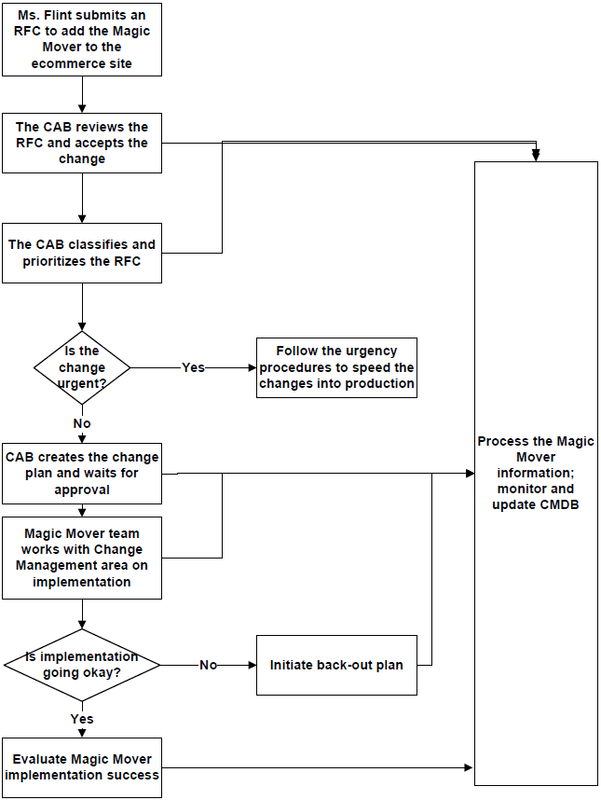 Figure 2.3: Magic Mover Change Management process flow. Management and the other ITIL processes that I pointed out in the Magic Mover scenario. These relationships will be similar for any type of change. Table 21: Change Management relationships. 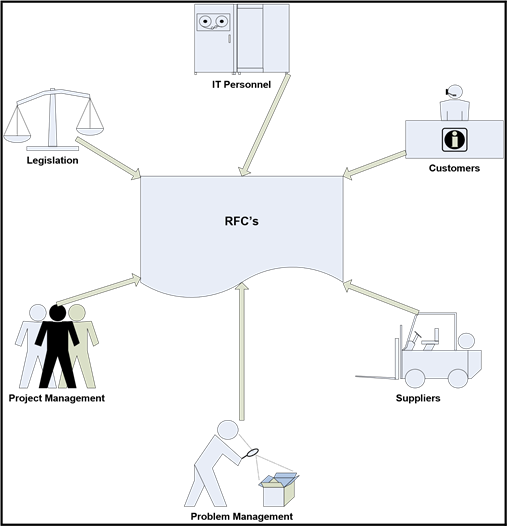 RFCs come from many different sources, as represented in Figure 2.4. Management will be able to determine whether the request will be treated as a service request, as a change, or will be denied. This categorization is good because it helps to sort out the service requests so that the CAB does not need to spend valuable time considering them. Change Management also makes an initial decision for denying RFCs if they do not make sense, are impractical, incomplete or unnecessary; this saves additional time for the CAB. If the CAB accepts an RFC, they give it a priority and determine the category to put it in. Change Management uses an FSC to keep track of when each change will occur. The FSC will inform the recipients of upcoming changes. The FSC should contain enough information for the person responsible for the change to determine whether the change is going to affect them. The FSC allows both the IT and business areas to schedule changes appropriately. Business approval—The areas impacted by the change may need to provide approval. Financial approval—The IT area may need to perform a cost/benefit analysis and budget. Technical approval—The IT area will need to determine the impact, necessity, and feasibility of the change. If these approvals are obtained, the CAB will help plan significant changes and act as an advisory committee. To help facilitate effective use of time and make the most informed decisions, the Change Manager should communicate the details of the RFC to CAB members prior to the CAB meeting. Why Do We Need to Create the CMDB? To be successful with using the ITIL Change Management process, it is important that the people, processes, and technologies are working together in a coordinated manner to overcome the political roadblocks that usually inhibit cooperation between groups in the same organization. The primary goal of the CMDB is to house the CIs that exist throughout the enterprise and the relationships between them, revealing the status for each configuration at any time. 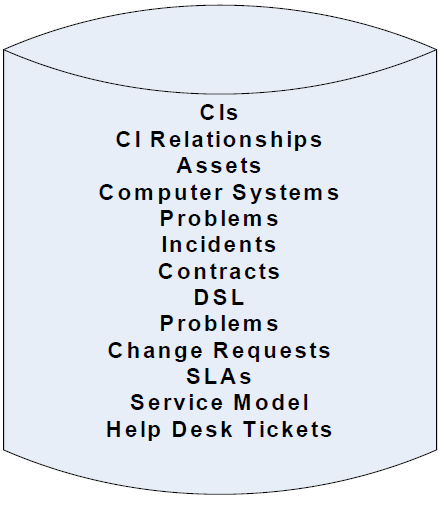 The contents of the CMDB will vary from organization to organization. For example, an organization with a comparably small IT area may be experiencing problems with application troubleshooting because the business units throughout the enterprise regularly implement new software at their own discretion. The CMDB solution they implement will need to constantly, and preferably automatically, track in excruciating detail application configurations so that quick configuration comparisons before and after a problem can be analyzed to identify root causes. The situation would likely be quite different for a very large IT department with the same types of application troubleshooting problems. The resolution process would typically span the Help desk area, many different IT experts, the customer relationship area, and the related business unit managers. For a large organization, simply capturing all configuration details in the CMDB will not improve the coordination effort; too many details will be confusing to the different players who only need to know some of the details. Instead, this large organization will probably decide to share the many different infrastructure relationships across the Change Management team members. Their CMDB could then contain the most basic device configuration data, relationship information, and information that points to additional sources of more detailed information. These two CMDB implementations are much different but they both provide benefits to business. They allow for shorter applications and systems problem solving and more efficient and error-free changes. By performing thoughtful and enterprise-wide efforts to prioritize process improvements, take into consideration the players involved, and identify the data sharing and use needs throughout the enterprise, each organization will be able to determine the best items to put into each of their respective CMDBs. The CMDB will contain data about hardware and software deployments. The CMDB will allow users to quickly see and report on the technical environmental details. The CMDB can contain data about servers, network devices, workstations, software, and any other network component. There are multiple tools and methods available to enter data into the CMDB. Most CMDB tools can populate the database as well as create customized reports to run at scheduled times as well as upon demand. The CMDB can track and create reports about the different components within the IT architecture and maintain the current CIs. Coincidentally, ITIL also directs that the CMDB should hold data related to CIs; some possibilities are shown in Figure 2.5. Figure 2.5: CMDB data items. A single, centralized, all-encompassing CMDB should have all the key information available to the entire organization to track all the CIs in the system, map dependencies of CIs, track the status of CIs, determine the history of CIs, and track requests for change for CI verification. Some of the fields you will want to consider using as keys to track the status for each CI are listed in Table 2.2. Table 2.2: Key fields within the CMDB. These key fields will not only help to make Change Management more efficient, the data can also be used to help measure the success with Change Management activities and automate the some or all of the Change Management process. A great benefit of the CMDB is that it can work with other IT automation tools. Many data center automation tools exist that can store information in the CMDB. By automating the CMDB, it can more efficiently achieve the goal of using the CMDB to provide IT personnel with a centrally managed storage repository for of IT data. The Change Management process enables IT to successfully deliver results that link people, processes, and technology throughout the enterprise to most efficiently meet business demands. Automating these relationships for the collection, orchestration, and management infrastructures, will accelerate ITIL processing and changes within the CMDB. When the triggers that launch changes to configurations and workflows are automated, IT does not need as much training as if it were all done manually. So time is not only saved by automating the processes but also by not needing to do as much training and not having to correct human errors. This automation will reduce downtime and make Change Management more controlled, consistent, and efficient from both a time perspective as well as a resources perspective. Automation also has the added benefit of being able to generate activity logs that in turn establish accountability for the actions that occur. A federated data model enables a CMDB to provide a single source of record for CIs. Whatever automation tool you use, it should seamlessly integrate all Change Management processes to avoid costly in-house time making it fit with your other systems. It is important for you to consider the costs involved with implementing ITIL Change Management processes. These costs will basically fall into two categories; people costs and technology costs. You likely already have personnel throughout the enterprise performing Change Management tasks. If you are not already using ITIL, it is likely that they are performing these tasks, but in silos, meaning they are repeating tasks. When implementing Change Management processes, you should be able to use some of these personnel that are now freed up for implementation. However, you will still need to utilize personnel to be on the CAB. You will need to plan carefully the hardware and software tools you decide to use for implementing Change Management processes, and ensure that they integrate with the other ITIL processes. A good, integrated technology tool may be a significant up-front investment, but if chosen and implemented correctly, it will result in long-term savings in other areas of the enterprise. Change Management metrics can help improve business. But to demonstrate this, it is important to create statistics and metrics to clearly show the improvements. Success must be documented in terms of improvements to the business. Total changes planned; "in the pipeline"
What kind of evaluations can you make from these seemingly nondescript numbers? Now is the fun part, when you get to do some math! The following are just some of the metrics you can calculate from the data. You can determine the change efficiency rate by dividing the total changes implemented by the total changes in the pipeline. For example, if you did 20 changes this week and you had 40 to do in the pipeline, your efficiency rate is 20/40, or 50%. This will tell your management how efficient you are at handling changes. This can be used to demonstrate your improvement in implementing changes by using ITIL compared with when you did not. You can determine the success rate and failure rate percentages for your changes by dividing the number of failed changes by the total number of changes implemented. For example, if you implemented 10 changes, but 2 of them failed, you would have a 2/10, or a 20% failure rate. Subtract this from 100% and this gives you an 80% success rate. You can determine how well you implement changes on schedule by calculating the change reschedule rate. Do so by dividing the number of changes rescheduled by the number of changes you had scheduled. For example, if you had planned for 40 changes this week but rescheduled 5 of them, your reschedule rate would be 5/40, or 12.5%. A very useful metric to reveal how changes impacted business productivity is the change incident rate. You can calculate this by taking the number of changes that created incidents and divide it by the total number of changes implemented. For example, if you implemented 30 changes this week and 5 of them caused incidents, your change incident rate would be 5/30, or 16.7%. Metrics such as these will tell you, and more importantly tell your business leaders, how efficient you are at implementing Change Management process components and where improvements are needed. Implementing the ITIL Change Management process will be an evolutionary process. It will take time and investment up front. It will be a learning experience. But, when done correctly, it will make your business more efficient and make IT more valuable in the eyes of your business leaders. Change Management implementation success will take the strong and steady commitment of your executive management to get through these growing pains. Be sure you have that to get the subsequent commitment of your ITIL team members and ultimately improve your Change Management processes.